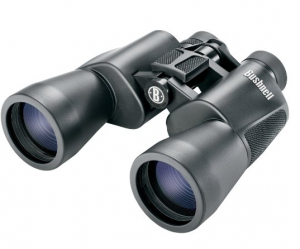 When it comes to binoculars, you only want the best, most rugged set you can get your hands on. They need to be reliable and able to take the abuse you might give them out in the wild, whether you’re exploring an untamed mountain side or searching for that deer you’re certain you just pegged. With the Bushnell PowerView Super High-Powered Surveillance Binoculars, you’ve certainly got a good start. This set of enhanced spectacles comes with a 170-feet field of view at 1000 yards, giving 20x magnification with a 50mm objective diameter. To put that into perspective, an object a mile away would look like it was only 264 feet away. Best of all, they come with a 45 foot focusing distance; this means that you can focus them in on a specific object within your view. This makes them fantastic for spying on animals from far away. Bushnell’s patented single touch focusing system helps to keep a specific object in very close focus with just a single touch. If your hands have a tendency to shake, this system will allow you to keep your target in view at all times, even if you can’t rely on yourself to hold still. The Insta-Focus works for moving targets, as well. This is a great set of binoculars for bird watchers. Okay, so they don’t actually have ‘night’ vision – but things do seem a bit brighter when viewed through the lenses. This makes it much easier to see targets in the dim light of dusk, making these a great choice when hunting in the early morning or later in the evening. The lenses feature multi-coated optics which transfer light more effectively when there is less to transfer, allowing you to see more clearly. At just 30 ounces, the Bushnell Powerview Surveillance Binoculars are easy to carry with you when you need them. They’re equipped with nonslip rubber armor. Not only are they easy to hold onto, but if you do happen to drop them, the rubber surrounding the binoculars will absorb the majority of the shock and keep them in one piece. These binoculars are designed to go long and hard in all conditions. When not in use, the fold-down eye cups will protect the lenses from harm. The Bushnell Powerview Surveillance Binoculars have an initial set up that owners will need to go through when using them for the first time. Taking the time to do this helps you learn to use them quickly in the future, rather than spending precious time fiddling with the focus to get it just right. This set up also establishes your own papillary distance, setting the binoculars to work specifically for you rather than someone else. Starting at just $49.99, these binoculars are practically a steal. They come in a variety of sizes: 10x50mm, 12x50mm, and 20x50mm. The cost for each size varies depending on a number of factors, but the Bushnell Powerview is, on average, more affordable than comparably priced models. No matter what you need a set of binoculars for, whether it’s hunting, paintball, or spying on people at the beach, this set won’t let you down. The Bushnell Powerview Surveillance Binoculars are a good entry-level set that isn’t likely to confuse beginners, making it a great gift for someone interested in getting a set of binoculars for themselves.